20% off for Green / Eco / Ethical Companies! We’re looking to expand our network locally, particularly towards green and ethical companies or organisations. 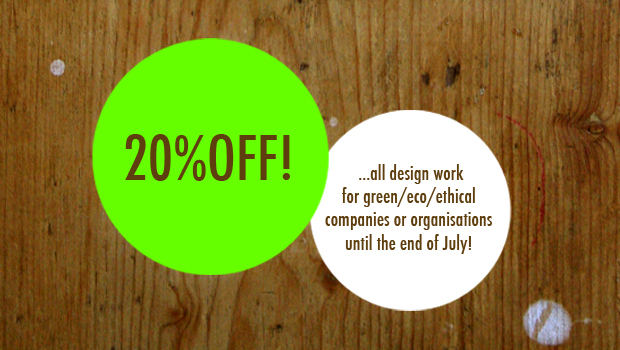 To help promote this we’re offering 20% off all design work to green / eco / ethical companies until the end of July this year! Yes, wow indeed! As some of you will already know, we’ve worked with a number of local charities, community groups and organisations locally over the last couple of years, such as Bradford Community Environment Project (BCEP), Wibsey Park Community Garden, Bradford Environmental Action Trust (BEAT), Why Waste and Annie Berrington at Get Out More Forest School CIC. We really enjoy getting to know the people and projects and get great satisfaction from working with them. We don’t like to blow our own trumpets so here’s what Annie Berrington at Get Out More CIC had to say about the work we carried out for her last year. If you think we could help you or you know someone who would benefit from our special offer before the end of June then please get in touch or share this post!